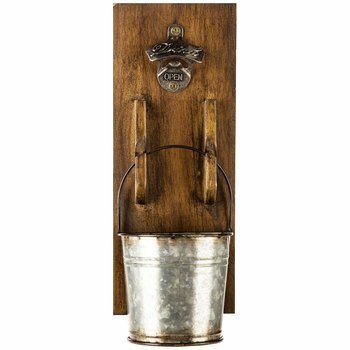 ✓ EVERYTHING YOU NEED (EXCEPT FOR THE BOOZE) » 14-Piece ALL-INCLUSIVE Bar Set of serious quality bar accessories. 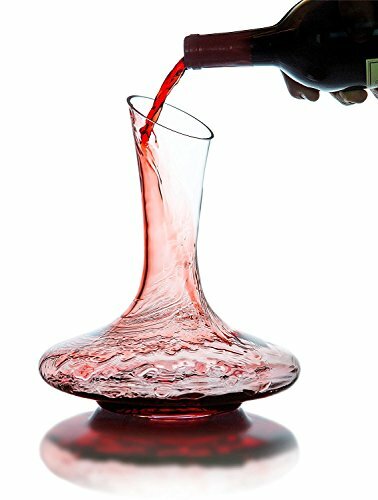 Will give you the power to whip up impressive cocktails for your guests. Whether you’re an amateur bartender or a cocktail mixing guru, whether you’re setting up a bar at home or at work – Mixology & Craft bartender kit is a brilliant way to hit the ground running. 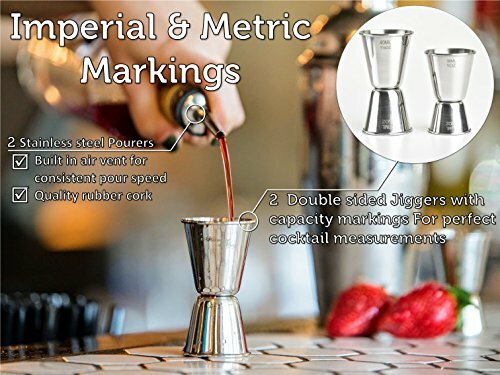 ✓ CREATE EXCEPTIONAL COCKTAILS WITH EMBARRASSING EASE » using the leak-proof, 24 oz bar mixer (make up to 3 drinks at once!). 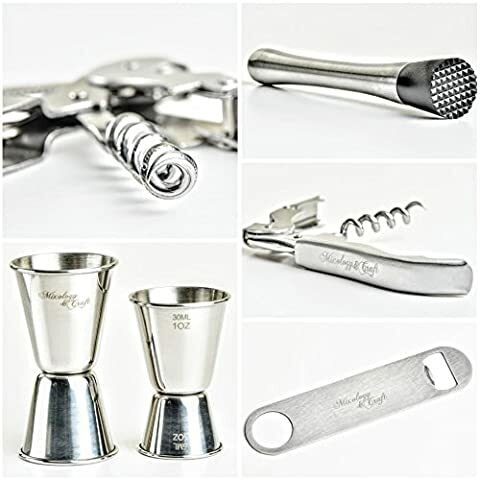 Construct your cocktail set with the best bar tools, used in the world’s top cocktail bars and bartending competitions. ✓ UNDENIABLY THE PERFECT GIFT FOR COCKTAIL LOVERS » First-class bartending kit packed inside a durable, handsome cylindrical case. Your recipient will be thrilled like a child in a candy store! 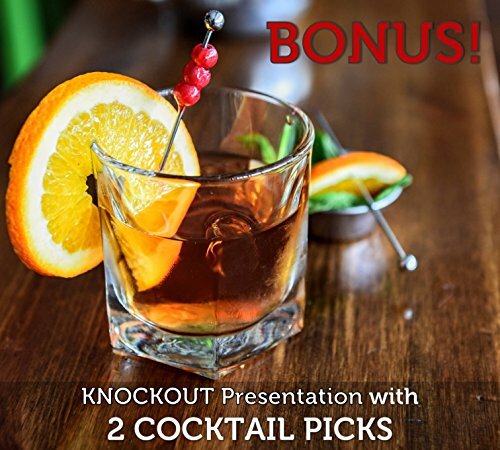 Plus, to make things truly delicious, we’ll throw in TWO EXCLUSIVE BONUS GIFTS: “Mixology&Craft’s recipes experience,” an online COCKTAIL CATALOG, and two professional COCKTAIL PICKS to add a fun, visual element to your drinks – and to guarantee a knockout presentation. Mixology is more than just pouring spirit with soda into a shaker and executing a winner cocktail do requires some skill. Want to make those yummy cocktails by yourself, but don’t know how to start? Want to score the full flavor’s horsepower out of your drinks? WHY IS THIS THE ONLY BARTENDER SET YOU’LL EVER NEED? 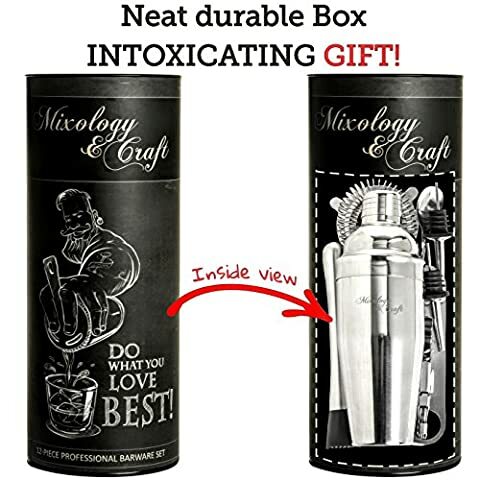 Mixology&Craft crew put together the most imperative top-grade drink mixing set with fair price. 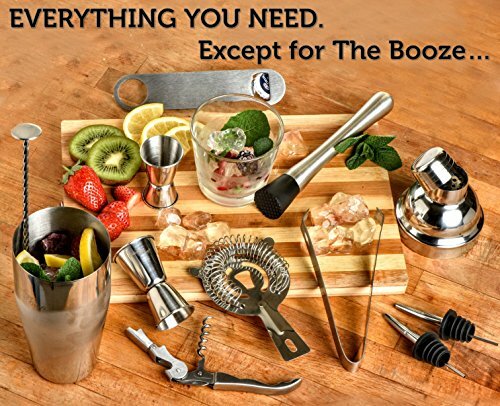 Crafted with great Care, it includes everything you need in order to fix your favorite Martini, Margarita, Daiquiri, Mojito, Cosmopolitan, Piña Colada or Bloody Mary at home! 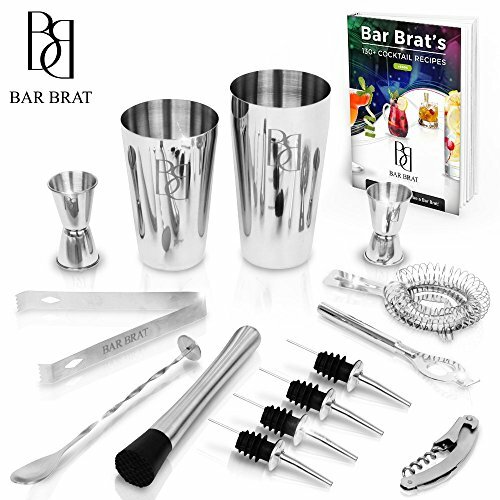 Amateur or experienced mixologist – this cocktail set is perfect for you! Rustproof 24 oz cocktail shaker – Premium SST grade. Including a built-in strainer for holding back ice when pouring and a top sealing shaker cap does not leak when shaking. Two Double sided Jiggers – (15/30 ml and 20/40 ml) with imperial and metric markings to ensure perfection measurements on your cocktails. 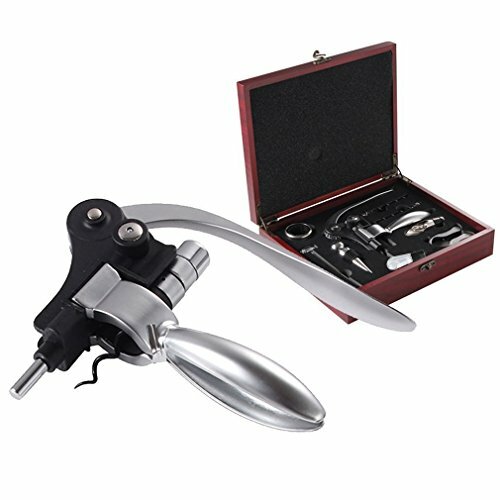 Double lever corkscrew – Really easy to use, lightweight and hold in your hand well. The two step lever action makes withdrawing the cork from the bottle easy. Includes a small foil cutter. Bonus – free online access to “Mixology&Craft book of recipes”- A yummy feature that will introduce you to an amazing world of cocktails! 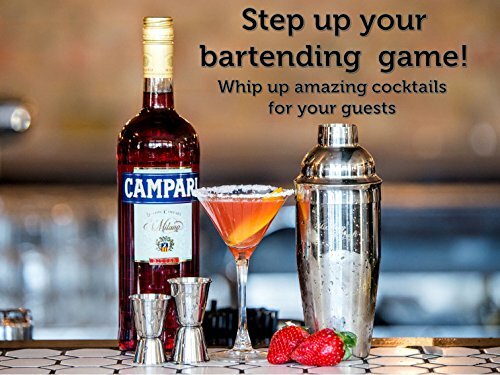 —> Click on the Add to Cart button above and enjoy your new bartending kit! 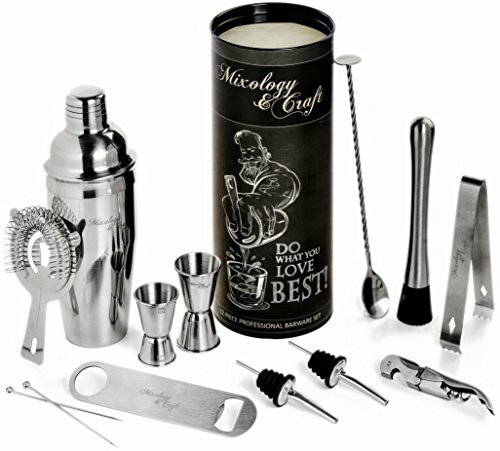 ✓ UNBREAKABLE AND RUSTPROOF » Heavy-duty and high-grade, rustproof, stainless steel mixology kit. Unlike similar barware sets who rust easily, this entire cocktail kit is made of the highest quality stainless steel alloy: SS304 & SS430. Worry not! it’s all dishwasher safe, so forget about wear and tear with this bartender set. Top quality guaranteed. ✓ YOUR PURCHASE IS 100% RISK-FREE » At Mixology & Craft we put our heart and soul into our bar kits. So much that we offer you an EXTENDED 3-YEAR WARRANTY for your mixology bartending set. Plus, if you are not satisfied for any reason at all, we guarantee a full refund on the spot. Follow your heart, add to your cart!